It is nearly 6 years since I first became a Mummy - back then, one of the very first things that I became un-mellow about as a parent was Lara's incredibly dry skin. Over the years, I've learned that dry skin is, in fact, very common and because a baby's skin is more delicate than that of an adult, it can be more susceptible to becoming dry and sensitive. I've learned a few tricks of my own for tackling Lara and Holly's dry skin over the years and so I was delighted to be involved in the creation of the Oilatum Comfort Skin Tips. 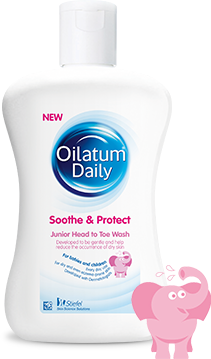 The Oilatum Daily Junior range is a set of skincare products from Oilatum, the dry skin specialists, but which is specifically designed for babies and small children with dry skin. I have, over the past few months, fallen a bit in love with the Oilatum Daily Junior Moisturising Lotion which I use on Lara, Holly and myself to keep arms and legs feeling smooth. Oilatum Daily have teamed up with the British Skin Foundation and have listened to mums of children with dry skin in order to create the Oilatum Comfort Skin Tips, 10 easy-to-follow pieces of advice which can help parents to manage the problem of dry skin every day. Tip 2. Try to keep your little one's bath time to 5-10 minutres as too much time spent playing in the bath can cause excess drying out of the skin. Tip 5. Moisturising cream can be especially effective when your child's skin is damp, so apply it as soon as you've patted them dry to lock all that moisture in. Top 9. Wash clothes and bedding with non-biological products that are kind to dry, sensitive skin and rinse clothes twice to be extra sure that all traces of soap residue have disappeared.